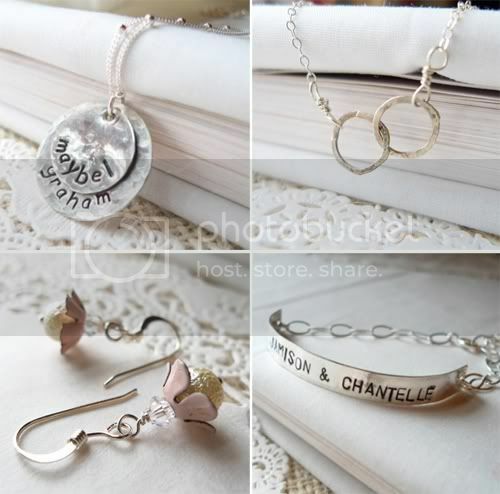 chantelle nicole's shop is filled with pretty personalized and hand stamped goods + treasures. i love the 'hearts on a string' necklace pictured above ;) this week, chantelle if offering a $35 gift certificate to spend on anything in her shop. good luck! please tell us a little about yourself and your shop: My name is Chantelle. I live in Knoxville, TN and soon will be moving to Nashville. I've been married for over a year and have three little babies. My dogs Romeo, Julie, and Toby. I create custom hand-stamped jewelry using sterling silver, freshwater pearls, and lots of love and care. My desire is to create simple, lovely pieces that can be worn with jeans or a little black dress. I want each piece to be meaningful, unique, and perfect for everyday. what inspires you from day to day: I am inspired by so many things! Photography, nature, and illustrations really help my creativity flow. favorite blogs/shops/websites: My blog reader is full of so many great blogs but, my top favorites are: snippet and ink, design sponge, creature comforts, and oh hello friend. 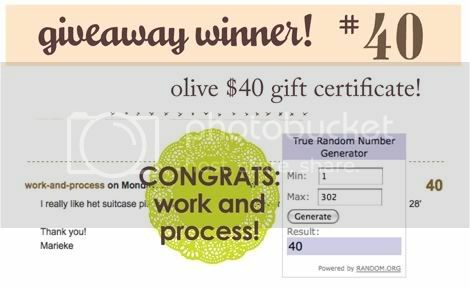 who won the $40 certificate from olive! Oh how I am loving her jewelry! That childrens name necklace is amazing...and with my 3rd one due anyday, winning would be quite fun! Your blog is amazing Danni. Thanks for the inspiration and beauty. This is such a great giveaway! My favorite item is the Leaves of a Feather Locket. It is too pretty! I think my favorite is the "Hearts on a String," but all of it is SO awesome. Hi! My name if Gina and I am a hairstylist/make up artist in the Salon and Educator by trade. I am inspired daily by beauty in nature, travel abroad, history, music, fashion, and of course hair. I love sharing the daily blogs I read with clients in the Salon. I love this necklace delicate and sweet perfect for everyday wear. Oh, what a choice to make. All of her pieces in her etsy shop are so great. I love the "Find the Joy in the Unexpected" necklace. I absolutely love all of her jewelry!!! I have actually ordered some before and her packaging is so perfect also! They make great gifts but if I win I think I will keep this one for myself! Thanks for such a perfect giveaway!!! I just can't choose there are so many wonderful necklaces! I love them all! What pretty jewelry! It's hard to choose a favorite. I fell in love with the hearts on a string necklace, but I also love the scalloped initial necklace. I adore the birthstone charm necklace idea, carrying my loved ones in every moment. Thanks a lot for the giveaway. Love the hammered freshwater pearl earrings! i love the amor vincit necklace. hand-stamped jewelry is so special! Actually, I really like all of the jewelry, but I like that the amor vincit is a bit different. The Hearts on a String is definitely my favorite! Great giveaway! Wow, what gorgeous pieces! They are all amazing! I love that shop, there are some many wonderful gift ideas! My favourite is the Love a Little Sterling Silver Heart necklace, so tiny yet to amazingly cute. I adore the flower pearl earrings! Such a great giveaway! so many pretty things to pick from! I like the rings or necklace (locket) with flowers, and the nest necklace is very pretty as well! They are so playful and sweet. I love the Cadena sterling silver necklace. So delicate! Its so hard to choose! They are all so lovely. I think I have to agree with you though, the hearts on a string is simply adorable. Its beautiful and understated. It's so hard to choose just ONE favorite thing in the shop!! I'd definitely have to say Turquoise Swirl Sterling Sliver Earrings! I've never seen earrings like them before!! Adorable Jewelry... I love how she takes everyday life and places what is so valuable to people on a necklace. I would be so proud as I wore it!! My favorite is the Grow Sterling Silver Hand Stamped Necklace. oooooooooooooo another beautiful shop for this weekly giveawy! I love so much the Grow Sterling Silver Hand Stamped Necklace! I just put a link to this giveaway on my blog! i love all of chantelle's jewelry in her shop. I love the heart on a string hand stamped sterling silver necklace! Thanks for sharing her gorgeous shop! I would love to win this giveaway to give the necklace to my friend whose sweet nearly-two-year-old son just passed away. I think it would be a perfect gift for her. I love the Itty Bitty Family Initial Sterling Silver Hand Stamped Necklace!! Oooooh, very lovely things in Chantelle's shop! I like the Lilly Tear Drop Sterling Silver Earrings. I love all of the monogrammed pieces...so cute! i really like the birdie love necklace. very cute. I love the "Sprouting Berries Hand-Stamped Necklace"
I love the lucky gold hand stamped necklace. so cute and feminine! so hard to pick!! but i guess i will go with the Bird on a Branch Hand Stamped Necklace. i love the extra touch of the pearl! So hard to pick! I do really like the Oval Monogram necklace! Great shop. i adore the scalloped initial necklace! so pretty. I love the Bird on a Branch Hand Stamped Necklace. i love the earrings. it's all so pretty! I love the Leaves of a Feather Golden Locket Necklace! its so cute! I love the Cadena Sterling Silver Necklace! I love this shop, thanks for the spot light!! I really love the oval monogrammed necklace!! all great pieces of jewelry. my favorite might be the gold locket with the rose on it. I LOVE the Itty Bitty Family Initials necklace - so beautiful and such a simple, great idea! I love the Simple Sterling Silver necklace! Oh wow! I love her Double Stacked Birdie Necklace. the eternity necklace is wonderful! though i do love all the stamped pieces also. oh my heavens! everything is gorgeous... i am loving the monogram stamped necklaces. it may be impossible to pick just on thing. I love the Grow sterling silver hand stamped necklace! I love the "Find Joy in the Unexpected" piece. A lot of the items are beautiful. It's all so lovely but I adore the a bloom. vintage brass ring! I was drawn to the Lucky Gold Hand Stamped necklace, probably because emerald is my birthstone! It's all so pretty but I absolutely love the a bloom. vintage brass ring! I am in love with the leaves of a feather necklace! I love the vintage brass ring from her Melancholy Finch Collection! So adorable! Loving the Find the Joy In the Unexpected necklace - has a LOT of meaning to me right now. Definitely hearted her shop in etsy - thanks for the introduction Danni! Ooooh, the Tree of Growth with my sweet little baby Elliot's name on it. Melt my heart... chantelle nicole's work is beautiful. I really love the reminder to find joy in the unexpected! So hard to choose, they're all so lovely. I like the Live Laugh Love Hand Stamped Necklace the most. the heart on a string necklace is so beautiful. i love her shop! wonderful shop. i love the heartstrings necklace!! it is beautiful! Thanks for the chance to win! I LOVE the Live Laugh Love Hand Stamped Necklace! i love the simplicity of her initial necklaces. The Live Laugh Love Hand Stamped Necklace makes me happy! Simple but so lovely! Anything with little birds on it gets me. Love the little bird on a branch necklace. So simple and sweet. Thank you! I really like the Simple Sterling Silver Necklace. i love the grow necklace..lovely for spring! I'm completely torn between the "I'm Hooked" earrings (I love the pale blue!) and a necklace with the child's name and birthday. The 'Vintage Rose Locket Necklace' is breathtakingly simple. I love vintage accessories. Love leaves of a feather necklace! oval monogram necklace. Thank you for a beautiful giveaway! I just love the "Sandy toes and Salty Kisses" necklace. It's so simple and pretty! Thanks for sharing this designer! i like the Double Stacked Birdie Necklace, but I also like the personalized pieces as well. My fav piece has to be the Mommy Love Giver Hand Holder Sterling Silver Hand stamped Necklace!!! Ooo, such lovely items! My favorite is the Love Gemstone Necklace. well there all amazing! i cant choose!!! Simple Hand Stamped Birdie Necklace in Copper... pretty. ah, i love the beach inspired bracelet. I love your blog btw, it is so calming. Good work on Haiti too! I loveeeee the "Itty Bitty Family Initial Sterling Silver Hand Stamped Necklace"!! Wow, all of her pieces are divine! My favourite is the Beach Inspired Hand Stamped Sterling Silver Bracelet. So hard to choose! I think my favorite is the Sterling Silver Bird on a Branch Hand Stamped Necklace. I liked many of the goodies in her shop! I especially loved the uniqueness of the copper pendant necklace! So many beautiful pieces! My favorite is the Birdie Love necklace. I was looking for some jewelry designer that use words in their jewels ! How amazing it is you make me know Chantelle ! Live Laugh Love Hand Stamped Necklace.. a simple but joyfull piece of jewellery! would love the initial w/ birthstone to represent my newborn babe!! Oh, I love the Garnet, Labradorite, and Smoky Quartz Earrings. So lovely!!! Oh goodness - I LOVE these. I would choose the Itty Bitty Family necklace -- an M and an H for now (me and my sweetie) but would love to add more once little ones come. Beautiful. wow, she has a lot for sale! my favorite is the vintage locket. oh i love bella's rose ring. so many beautiful pieces! hard to choose between the vintage rings and the necklaces of course! So many great pieces to choose from, but I love the Ruby Quartz Earrings and the Sterling Silver Large Interlocking Eternity Necklace. I've always wanted a monogram necklace, but not necessarily with the traditional script you see on most. This piece definitely reflects my modern aesthetics. Love it! the vintage rose locket is TO DIE FOR. i love lockets so much. there's such a romantic sentiment to them. i would totally love this one. oh I love the Itty Bitty Family Initial necklace. Thank you! I really like the ID hand stamped sterling silver bracelet, I've been meaning to get one for some time now, I think I will, now that you introduced me to the line! great stuff, thanks! My favorite thing is the Birdie Love Necklace. Oh, the Mother Bird Nest Necklace is lovely -- particularly the one with the gorgeous gray pearls. I love the birdie love hand stamped necklace! awsome giveaway. i have many favorites. tiny gold drop, small eternity necklace, and Lucky Gold Hand Stamped Necklace (just to name a few). I hope i win! oh, goodness! She's from my hometown and it's all so lovely! Although the sterling silver small interlocking eternity bracelet is definitely my favourite. I love the Sterling Silver Small Interlocking Eternity Necklace! So lovely! And thanks for this beautiful blog, Danni! I like Sprouting Berries Hand-Stamped Necklace. My favorite item is the "Hand Stamped Love Conquered Necklace" but all the work is so pretty! its with the two round pieces of silver for the names to put my hubbys and mine. and im heading over to facebook to post away. I'm kinda new to your blog as in I just saw it today, but it's eye-blinkingly beautiful. the mother bird nest hits a soft spot in my heart. for me it would have to be the sweet pea necklace, the bloom vintage brass ring, simple copper single stone necklace. Love the heart on a string hand stamped sterling silver necklace. I *heart* Sprouting Blossom necklace! wow, i really love her vintage rose necklace! it's an absolute beaut! there is no way i can just pick on item... i love them all! the just be and the love on a heart and the silver bird on a branch. they're all so lovely! there is an amazing giveaway a fun blog i read. go here to check it out! if you cant tell from that, you can go look at my facebook page and see the link! brittany davis barney is my facebook name! thanks so much, would love the chance to win, but i know you have many fabulous fans. thank you so much! The tiny mother bird nest necklace is so cute! I think that this interlocking eternity necklace is sooo cute! I was struck by the HAITI DISASTER RELIEF Breathe Hand Stamped Sterling Silver Necklace. On several levels this appeals to me. My mantra at the moment is breathe (to relax, to enjoy the moment....) Also the money goes to the Haitians - win win! The "My Love My Life Hand Stamped Necklace" is divine. I love the "Sprouting Berries Hand-Stamped Necklace"...I have to be honest, I think It's perfetc for me!!! I really love the Mother Bird Nest Necklace and the name tag hand stamped necklace. Wow, these are all so beautiful, I am not sure what I would definitly pick out but the Charming Hammered Freshwater Pearl Necklace would be at the top of my list. oooh such a lovely shop again! I love the vintage simplicity of Scalloped Initial Necklace ... beautiful! wow! how to choose?! I really like the mother, daughter, friend. I love the Leaves of a Feather Golden Locket Necklace! love her handstamped ID bracelet! too hard to pick one but i do love the Itty Bitty Family Initial Sterling Silver Hand Stamped Necklace. the jewelery is beautiful. It's hard to pick just one but I do like the rock crystal earrings...charming. I hate to sound repetitive but it is so difficult to choose a favorite piece. All of this work is just so lovely and unique! I suppose if I have to choose a favorite it would be the Love Gemstone Necklace..it's fantastic. Keeping fingers crossed! Thanks so much for doing the giveaway! thanks for the giveaway, danni! my favorite thing right now is the chalcedony drop earrings. so pretty! 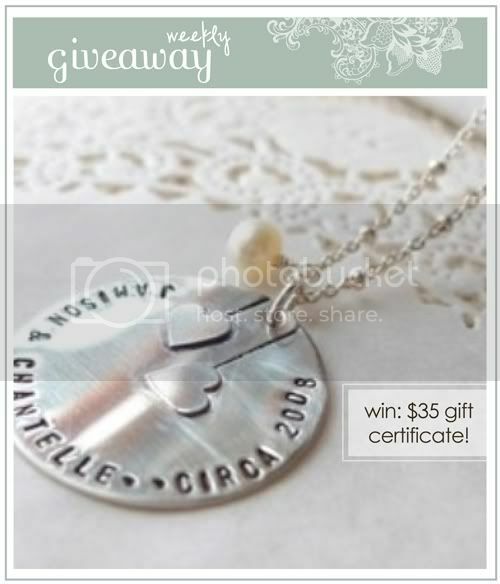 I love all the jewelry at ChantelleNicole but my favorite is the Family Hand Stamped Sterling Silver Necklace! Beautiful work! Posted to my facebook as well!